The Pittsburgh Steelers effectively defended Heinz Field on Thursday, soundly defeating the Tennessee Titans 40-17. The QB Ben Roethlisberger to WR Antonio Brown connection was strong, as the pair hooked up for 146 yards and three scores. Roethlisberger threw for 299 total yards on the night, and RB Le’Veon Bell had over 100 yards from scrimmage. QB Marcus Mariota ended the night with four interceptions, but he did throw for a touchdown and ran another in. RB Derrick Henry was solid on the night, gaining 32 yards on seven carries, and while RB DeMarco Murray was shut down in the run game, he added five receptions for 37 yards. The Steelers defense effectively took advantage of their turnover opportunities and stymied the Titans offense enough to walk away with a fairly stress-free victory. With that, we give you our PFF exclusive takeaways from the contest for each team. 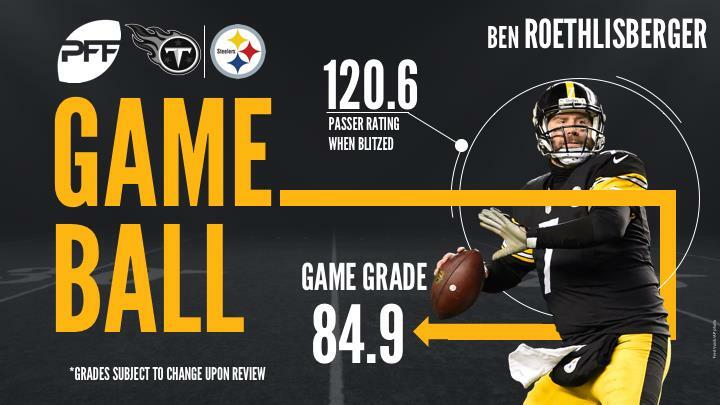 Outside of a few off-target throws, Ben Roethlisberger was solid all night. When the Titans were not able to get pressure on him, which was the majority of the night, Roethlisberger had 27 of his 30 completions, all four touchdowns, and a 123.8 passer rating. Overall, when adjusting for three drops, a throwaway, and a spike, he had a 76.7 adjusted completion percentage on the night. After a few sub-par games by Brown’s standards, he had one of his best games of the year. Roethlisberger targeted him a dozen times, with Brown hauling in ten catches for 146 yards and three touchdowns. Roethlisberger had a near-perfect 156.9 passer rating when targeting Brown. If not for a fumble at the end of the first half that could have prevented a field goal opportunity, Brown would have graded even higher. His 2.85 yards per route run on the season now ranks second in the league to only Julio Jones. Cameron Heyward was too much to handle for the Titans offensive line, as he recorded three sacks, a hit, and three hurries. A lot of the damage was against Quinton Spain, who was unable to deal with the strength of Heyward. In just his second game of the season, Coty Sensabaugh was able to produce an excellent game against his former team. While he did allow the 75-yard touchdown pass to Matthews, outside of that play he was shut down in coverage, only allowing two other catches for 10 yards on six targets and bringing in an interception. On the first play of the second half, Matthews took a pass from Mariota for a 75-yard touchdown to close the scoring gap, but that was as close as the Titans would ever get. Outside of that play, Matthews was able to catch four other passes, but he was unable to make plays after the catch on those balls, only recording 9 yards after the catch on those four catches. People will look at the raw stats that Mariota produced and assume he was awful due to him having four interceptions to one touchdown, however that would not tell the whole story. While he might not have been great, he was not as bad as the numbers suggest. The interception at the end of the second half was not on Mariota, as Corey Davis slowed his route and allowed Coty Senasbaugh to cross his face and make the interception. And if you add the dropped pass by Delaine Walker that should have been a touchdown, his statistics could have easily been much better. Mariota had some very good throws, but did struggle throwing across the middle of the field. When throwing 20 yards or less, he hit 50 percent of his passes and threw three of his interceptions. Ryan allowed one touchdown to Brown, but otherwise had a decent outing. Overall he gave up four catches for 42 yards, and broke up one pass. He has now allowed a touchdown but also broken up a pass in each of the past three weeks. It was a mixed-bag performance by Jackson, who was tasked with covering Antonio Brown for much of the game. He was targeted 13 times, allowed 10 catches for 97 yards, all of which are season-highs for Jackson. That said, several of the completed passes were short and didn’t even pick up a first down on the play. He also broke up two passes for the third-consecutive week, and is tied for the league-lead with 10 pass breakups on the year.